The Federal University of Agriculture, Abeokuta (FUNAAB) and other tertiary institutions in the country have been charged to take advantage of the Federal Government’s on-going reforms in the agricultural sector “to transform their revenue profile as well as build their reputations”. The Deputy Governor, Operations, Central Bank of Nigeria (CBN), Mr. Tunde Lemo, gave the charge while delivering a Lecture titled, Agriculture As An Effective Tool for Accelerated Economic Growth at the University’s 3rd Night of Excellence and Productivity Award Ceremony, held at the Bishop’s Court, Onikolobo, Abeokuta. According to him, the present administration of President Goodluck Jonathan had embarked on radical transformation of the ailing agricultural sector by partnering with the CBN, Alliance for Green Revolution in Africa (AGRA), state governments, private sector and other relevant agencies. He expressed confidence that the on-going reforms will succeed because it embraced “a strategic end to end, value chain-based approach to development” unlike the previous attempt which failed because the reformation of the agricultural sector was “segmentally targeted”. 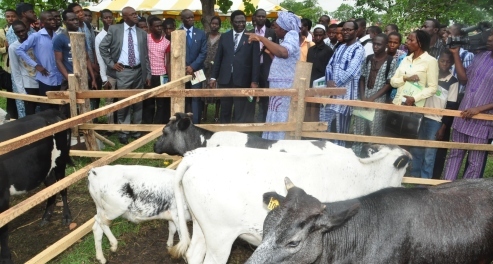 According to the Guest Lecturer, one of the reform programmes, is the collaboration between the CBN and AGRA at developing agriculture through “a strategy that is focused on unlocking finance to agriculture, addressing logistics and infrastructural constraint towards enhancing agricultural productivity, profitability and food security”. Mr. Lemo further informed that the Federal Ministry of Finance had put in place, a mechanism to share risks with the banking sector by ensuring the guaranteeing of 70 per cent of the principal of all loans made for the supply of seeds and fertilizers by the private sector. He stressed that in order to get the inputs across to farmers at affordable cost, CBN is subsidizing the interest rate, from 15 to 7 per cent, per annum. Mr. Lemo disclosed that government, having realized that only 11 per cent of its subsidized fertiliser reached the intended farmers under its support programme, had checked the inefficiency by opting for a private sector-led fertilizer distribution system which utilizes input vouchers to distribute directly to farmers. The CBN Deputy Governor, who articulated several on-going reforms, charged FUNAAB Management and nation’s Ivory Towers to key into the reforms and take advantage of it, to boost their revenue profile and enhance their corporate reputation. Mr. Lemo said “production of high quality seed varieties is an area where the Universities are strategic to the programme, as research institutions. It could serve as veritable source of revenue for research institutions including the Federal University of Agriculture, Abeokuta, through partnership with seed companies”. Earlier in his Lecture, the renowned banker identified policy inconsistency as the bane of agricultural development in the country, lamenting that Nigeria had conceded its pivotal and trail-blazer role in agricultural growth in Africa to the more committed countries like Malawi, Kenya and Burkina Faso, among others. He called on stakeholders to support the ongoing reform in the agricultural sector, expressing optimism that having taken-off on a solid footing, the programme will be a success.